The Colors Of Indian Cooking: I've Got My Goat, plus Now I smoke My Own! I've Got My Goat, plus Now I smoke My Own! and me with a goat in the fridge merrily defrosting. That was my worry. 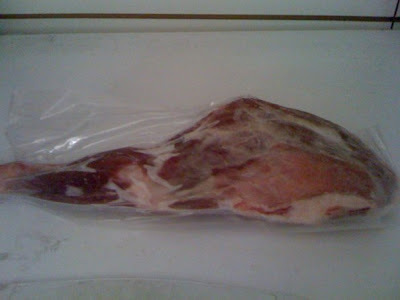 That it would defrost way too fast, and my goaty feast would be ruined. Not to worry thanks to the brave lads at the PG&E, modern science prevailed and a few hours later, we had the lights on again. I found this out because having gone to bed in total darkness I thought I'd turned everything out. But how can one be sure of extinguishing a light that has already been outed. Paging Umberto Ecco!! Around 1:00 o' clock in the morning,the lights came on again. In the bedroom, and everywhere else in the house they'd been left on. Note to self: when going to bed in a power outage just unplug all the lights and make sure. Happily, my goat did not suffer any ill effects and tomorrow there will be photos of the goat in process. for today however I recorded a piece for my podcast The Colors Of Indian Cooking and thought I should back it up with a post, so here goes! 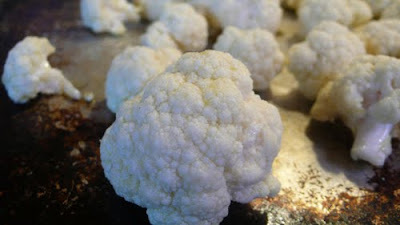 When I saw my friend Vegetable Matters' wonderful recipe for roasted cauliflower, I was hooked. After years of Indian cooking I'm crazy for cauliflower in all forms and when I showed the recipe to Alan, the mere mention of sage salt hooked him. My husband is a salt freak. When I mentioned that the recipe featured Maldon Sea Salt which is his very very favorite salt in the whole wide world I knew this dish was a done deal. I am not the salt gourmand that Alan is. I love exotic salts and use them often, but I have to admit my ability to discern the difference between them is lacking. Maldon salt which is featured in this recipe happens to be a staple at our house. We were first introduced to this salt while at Paula Wolferts' house for dinner. She had recently gotten hooked on it and of course gave us a box. That was all it took. We were in. Fortunately, our neighborhood Sonoma Market always carries Maldon....except this week when the recipe was published. This week they happened to be out. So we had to wait to get our chance at trying this dish. They promised me my salt on Tuesday but it wasn't on the shelf . Finally, after a bit of rummaging in the back of the store we had our precious box in hand and coincidentally there was a sale on local cauliflower!! Luck was running my way. However Sonoma has been subject to a sudden severe Canadian freeze. Temperatures on my deck plunged to 22 degrees overnight. My sage froze and died. Once again a wait and search for sage. This morning, the stars were in alignment, I had my sage, my cauliflower, and my Maldon salt. the cauliflower dish was a go. First off, I made a bottle of Sage salt. I fried fresh sage leaves in 1/4 cup of olive oil, blotted the crispy leaves dry and crumbled them into a bowl containing 2 Tbs of Maldon salt. I placed my salt in an airtight bottle and began to roast my cauliflower. The recipe was also courtesy of Vegetable Matter. I started by washing and breaking my cauliflower into florets. Then I rubbed them with olive oil, dusted them with sea salt and placed them on a cookie sheet in a 375 degree oven, with a pan of water an inch deep placed on a rack below the veggies. 30 minutes later they were roasted beautifully. I then took 2 Tbs of butter and browned it in a small pan. When it couldn't smell any better I added in the zest of 1 lemon, and then the juice of that same lemon. I poured the buttery lemony goodness over my cauliflower and sprinkled on the sage salt. Divine. That's all I can say. Cauliflower haters, get thee behind me! I can't wait to see your goat post Kathy! On the eve of a big event, before Christmas, eyes and ears all across the U.S. are fixed on a national spectacle in Wisconsin– formerly known as America’s Dairyland, but still on the vehicle license plates. The event will be Monday, December 21–a big raw milk rally and court case for Max Kane. The crime here is offering raw milk to members of a private buyers club and refusing orders to fork over the supplier and customer list. Farm to Consumer Legal Defense Fund, in a strategic, last-minute move, filed a law suit against the State of Wisconsin (their news release is below). After temporary victories in South Dakota and Massachusetts last week, a Wisconsin win on Monday, could set a national precedent for the rapidly growing raw milk movement. Author and Journalist David Gumpert has more details here. Do you really have your own goat? @pt..no, that was just a figure of speech...I have goat meat from a neighboring farm in Petaluma, as to any livestock we have it's limited to Patsy the dog. I have been thinking of getting some chickens though. We live up on a hill adjoining a vineyard so we get a lot of critters passing through, deer, foxes, raccoons and the occasional bobcat. D. I have to get this Malden salt but haven't seen it anywhere! Patsy looks dignified and harmless in the pictures but I know that she is going to be snuffling around under the table tomorrow night trying to snag some goat in a quite undignified fashion. nice meal. i'll cook it too. Cauliflower means "karnabahar" in turkish. happy new year. Lol! Kathy I enjoyed your post. Since you love Indian food, when you come here you will get the taste of the regular power cuts! Make sure no goat in tow. Looks great! I love the sage idea. my husband is used to eating goat in India, I have a feeling that this is going to be a lot more tender as it's organically raised by a local farmers' co-op, just about 5 miles away in Petaluma. Paula Wolfert and I have both purchased goat from them and she's cooked hers first and said it's quite wonderful. I loved this! I love seeing bloggers cook other blogger's recipes. And Maldon is the best. Kathy - I love your catchy title...I just have to smile. Great post. Your Patsy is a beauty! thanks, she knows it too!